Place the salmon on a parchment-lined baking pan and score the salmon down to the skin every two inches (without breaking the skin). Whisk together the mustard, soy sauce, sesame seeds, sugar, onion powder and oil and pour half of the mixture over the salmon. 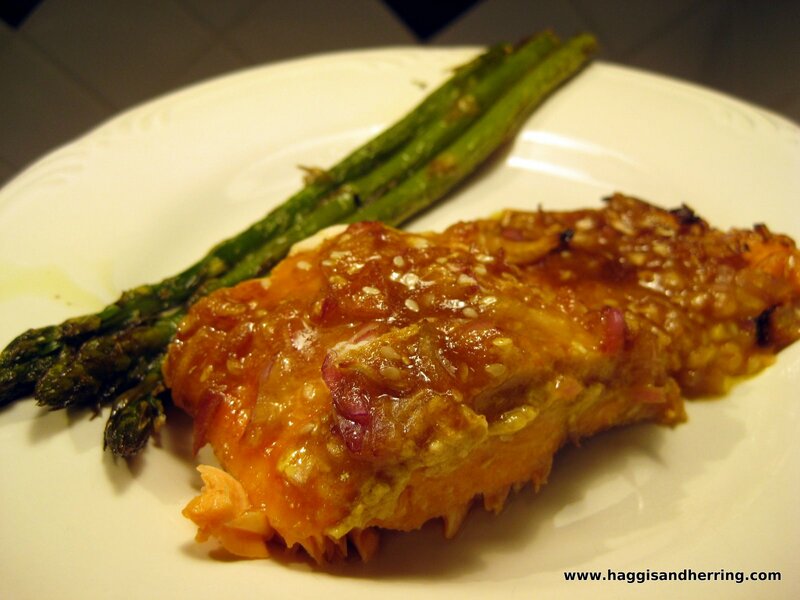 Put chopped red onion on top of each salmon piece and drizzle the remaining marinate over the fish. Transfer to oven and bake for 15-25 minutes. Note: for gluten-free, check label of soy sauce. I am from British Columbia and am always looking for new ways to add more flavour to one of my favourite coastal fish.This recipe is packed with flavour. Just wanted to let you know I made this and it was AWESOME. What a tasty sauce! So full of flavor, and the salmon was perfectly cooked in about 25 minutes (I had a thicker piece).